At my son’s Quaker school, Tuesday mornings begin with Meeting for Worship. The school maintains silence from 8:30 to 9:00—no ringing phones or talk in the hallways, the children gathered in their classrooms in meditative circles. This morning, Meeting was different, though. My son’s second-grade teacher had invited parents to attend. He led the circle as John Woolman, an American Quaker from colonial times who spoke out against slavery. The second-graders have been learning about Africa and the roots of Abolitionism, and I found this connection with Quaker history revelatory. It’s also Election Day in Massachusetts. The Democratic primary will likely determine who gets Ted Kennedy’s Senate seat, even before the actual Special Election in January. Yet pundits say turnout will be low. Whatever you think of the man’s foibles, Kennedy’s long tenure as a Senator made a difference to working people. So what if it’s cold outside? This is New England; it’s not too cold to vote. All right, I’m entering into pundit land myself, which brings me back to John Woolman—although not in the way you might expect. I now know that Woolman wasn’t your average political loudmouth. My son’s teacher, Chris Hoeh, had asked parents to wear the simple garb of Quakers at the time, usually black clothing with a bit of homespun white. Some of us did, but it turns out he was wearing an off-white shirt, white pants, even a white hat. The reason why became part of the lesson. He not only opposed slavery—at a time when some Quakers in the American South still owned slaves—but he spoke out against the injustices suffered by the poor. Chris, speaking as Woolman, told us about his life and why he’d come to feel what he did. He explained that although many Friends dress in dark garments so as not to glorify themselves, he had decided he could no longer wear any cloth that was dyed. The reason? The dark dye (indigo) was produced on plantations that used slaves. Chris later added in response to questions from the kids that Woolman probably wore no cotton either, only wool. I had never realized consumer protests went back this far. 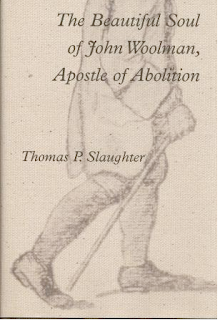 Perhaps that only reveals my ignorance as a non-Quaker, but it seems few on the American protest scene—from anti-sweatshop activists to Teabaggers—know of Woolman or his quiet testimonies. William James referred to him as a Quaker “saint.” Regardless of my uneasiness with spiritual terms and hagiographies, this wintry morning I felt illuminated by a bit of sunshine. As a magazine writer, I’m fascinated by another tidbit: Woolman’s Journal (published after he died) is sometimes called one of the oldest American serial publications. I confess, I’m not a humble truth-seeker. But I feel moved to point out that this is another dangerous time for Americans, one in which it’s far too easy to give way. The freedom to speak out in public—to “quake” with the power of one’s beliefs, even if others are opposed—is something Quakers hold dear. Woolman spoke up years before the Declaration of Independence was signed, but these days I wonder if children sometimes have a firmer grip on the truth than adults. The second-graders asked many questions during the Meeting. They were restless by the end, but they seemed unusually attentive. Other adults were there, including the Head of the School in a black Quaker-style hat; their teacher was acting the part of somebody else, riveting in its way. I wondered how much of this my son, part of the restless contingent, was really taking in. But one story captivated them all. Chris described a childhood incident in which Woolman saw a mother bird and her babies in a nest. As Woolman told it, all he thought about at that moment was whether he could hit the bird with a rock. So he aimed and threw high into the tree, and down came the mother bird, who then lay dead at his feet. “What happened to the babies?” one boy asked softly. “They died,” the same boy said. “Because their mother died,” my son added, not looking at me. For my restless child, an adoptee from Vietnam, this was not an idle remark. But it wasn’t for any of the others either. In Woolman’s story, he climbed the tree to kill the baby birds quickly, knowing they wouldn’t survive without their mother, feeling terrible remorse. No parent wants to make children feel such grief, but I welcomed this moment in a classroom of middle-class kids. This teacher was not scared of presenting the ambiguity. People can be cruel to one another, even Quakers who profess their own inner light, even children who like to throw rocks. And life itself is full of difficult-to-resolve questions. “I have sometimes felt a necessity to stand up,” Woolman wrote a few days before he died of smallpox. He was 51. [B]ut that spirit which is of the world hath so much prevailed in many, and the pure life of truth hath been so pressed down, that I have gone forward, not as one travelling in a road cast up and well prepared, but as a man walking through a miry place in which are stones here and there safe to step on, but so situated that, one step being taken, time is necessary to see where to step next. For more information on Quakerism, take a look at Quaker.org and Quakerinfo.com, as well as the link to the Friends General Conference from this post’s title. This entry was posted in Abolitionism, election day, grief, John Woolman, liberty, moral development, politics, Quaker education, Quakers, Ted Kennedy by Martha @ Athena's Head. Bookmark the permalink. All I can say, Martha, is wow. Powerful story and you sure can write! What a fascinating story of John Woolman. This kind of history totally intrigues me. I had started researching the abolition movement in England earlier in the year hoping to write another book set in England. But alas, my publisher moved me to an American setting for now. But I loved reading your post and am tucking this information away for future reference! Thank you! Ande thanks for stopping by my blog yesterday! Thanks! Glad to stop by your blog, Jody, I really enjoy it. I was fascinated by Woolman, too, and surprised (and embarrassed) that I'd never really heard of him before. ",,.he…also did jolly things like standing outside the meeting houses and as people entered bursting a previously concealed bladder of blood in his hands saying all Quaker slaveowners and people who permitted slaveowners in the meeting were covered with blood. "After he did this for fifteen or twenty years and got covered with spit and hatred, Quakers decided that no Quaker could own slaves and all Quakers were abolitionists (as opposed to gradualists, which is what they'd been before). Anyone who got lonely being an abolitionist could become a Quaker or hang out with Quakers. Almost anything you read about John Woolman would convince you he wasn't a fun person to be around – no small talk, all "The Lord's wrath will visit the land which permits man to own man," and such like, never a relaxed moment, but he did do the job as the vanguard of the vanguard, which can't be relaxing." We tend to bemoan the modern character, so inclined to take the easy road and disinclined to do the hard work of making the world a better place, but the human character has always been like this. We have always needed persistent gadflies like Woolman to get us off our butts. Great additional info, Joan. After cruising through Woolman's Journal writings yesterday, I did have the sense that he was quite the dour sort, but that really is in keeping with his gadfly actions. Although some would say–and he would claim–that he used simple words and actions to demonstrate his convictions rather than ravings. what a lovely and inspired reflection for election day……our american lore is so fraught with imperfect high-mindedness and ideals…makes the reading of our history that much more human, a little closer and more real to each of us. Thank you for steering me to this page Martha. I had always imagined the Quakers a reserved, quiet bunch, so how interesting to discover some were quite outspoken about their convictions. I'm going to check out the links that you provided and look forward to your post on OS. In response to the comment by Joanhello, regarding the spattering of pig's blood – this was actually done not by Woolman, but by another Quaker abolitionist, Benjamin Lay. Lay is infamous for his dramatic personality and even more dramitic methods of protest. The blood episode involved Lay entering Quaker meeting, removing his coat to reveal a military uniform worn underneath, and commenting upon slavery, he drew a sword and stabbed a (fake) blood filled hollowed out bible, splattering those standing nearby. Such actions resulted in Lay's disownment from the Society of Friends (less for his beliefs than for his manner of voicing them). John Greenleaf Whittier describes this episode in his introduction to John Woolman's Journal, which can be viewed at the Street Corner Society website http://www.strecorsoc.org/jwoolman/appre1.html. All I've read on Woolman consistently portrays him as mild mannered in his promotion of abolition, and that this humble approach was where his success in convincing others lay. I really enjoyed your description of your child's classroom experience. Sounds like a moving experience. Thanks for clarifying where the pig's blood came from, aili. Your comment and information is timely, because I'm reworking the piece this week for my blog on Open Salon, and I was going to delve into some of the history a bit more.